Fire near Beit Shemesh forces evacuation of Moshav Beit Meir. Firefighters continue to fight the fires across Israel. Firefighters continued overnight Thursday to fight the fires that are raging across Israel. At around 2:00 a.m. a fire broke out between Beit Shemesh and Jerusalem, near the religious moshav (cooperative village) of Beit Meir. Residents of Beit Meir, which is just off the Jerusalem-Tel Aviv highway, were evacuated from their homes, including 300 people at the guest house, most of them to the nearby town of Shoresh. 25 firefighting crews worked at the scene to extinguish the flames, and succeeded in doing so shortly before 5:30 a.m.
Reports said that several suspects fled the area as the fire began to spread. One suspect was arrested and police are searching for the others. 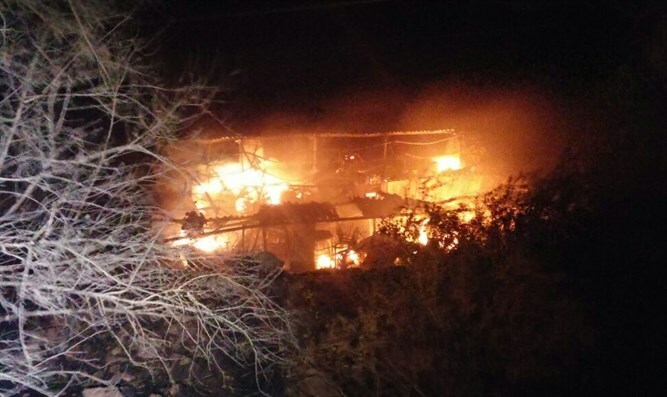 Earlier on Thursday night, the community of Har Halutz in the central Galilee was evacuated after a fire in the Karmiel area threatened homes in the community. Six houses were damaged in the fire, which was extinguished shortly before 3:00 a.m. and residents were permitted to return to their homes. Another forest fire erupted between Iksal and Nazareth Illit. Firefighters are working to extinguish the fire. A fire also broke out in a wadi near the community of Dolev in the Binyamin region, and several residents were evacuated from their homes. The fire was contained shortly before 3:00 a.m. and residents were allowed to return to their homes. Meanwhile, five homes were evacuated from the Arab town of Ka'abiye in northern Israel, due to a forest fire that broke out nearby. There were no reports of injuries or damage, but the evacuation was a precautionary step. The area which suffered the most damage was the city of Haifa, where 85,000 people in eight neighborhoods were forced to leave their homes. More than 300 firefighters backed by IDF troops and the Home Front Command are continuing to work to put out the fire. All IDF leaves were cancelled. Benny Zecharia, veteran firefighter, spoke to Israel Army radio from Haifa, stressing that although he has not slept since the fires began, what is impressive is the dedication of the firefighters and soldiers, some of whom came all the way from Eilat to help. "This fire is different from the Carmel fire of several years ago where there were terrible fatalities and an entire bus full of people went up in flames, but the fire was in the Carmel forest. In Haifa, it is an urban fire, and our biggest job is making sure every home endangered is emptied of its residents. We go from door to door and check out the apartments. It is terribly sad to see people's hard-earned homes go up in flames, but it is heartening to see the cooperation between the forces and how they care about each other and the people they are helping." Of some 200 fires recorded over the past three days in Israel, Internal Security Minister Gilad Erdan said it was estimated that roughly one half were deliberately set by Arab arsonists. Police have found flammable materials intentionally placed at sites where fires broke out and have so far arrested eight individuals believed to be responsible for some of the fires over the past three days.